From Kos we will sail easterly towards the Turkish West coast. This sailing trip will bring us to pristine bays (perfect for snorkeling) and along beautiful little secluded villages along the Turkish coast. This trip will be ideal for history and nature lovers. From Kos we sail the first day in easterly direction along the Turkish coast. Towards the late afternoon we will arrive in Cökertme, where we will enjoy a traditional Turkish dinner at Captain Ibrahims restaurant. Before we set out to next adventurous day of sailing, we will begin the day with a relaxed breakfast and a dip in the crystal clear water. If you are early, you might want to visit Ibrahim again for a real Turkish coffee or a perfectly sweetend mint tea. Our sailing day today will take us further east towards Akbük, a small tourist village with many campgrounds and restaurants along the beach. After a short sail we will stop for lunch on “Cleopatra Island” – Sideyri Adasi. A small island, with great ancient theaters and great history. We might decide to spend the night here or move on to Karaca Sogut. A beautiful bay, surrounded by lush green forest and hills. Today will take us along the beautiful Turkish coast and from here we will move westbound again. If the wind is in our favor, we will make it to Yedi Adalari tonight. Another prestine bay, along the green Turkish Coast. Here we will drop our anchor behind one of the many small islands and get to enjoy the unspoiled blue waters and little visited beaches. A trip along the Turkish coast would not be complete for us, if we would not bring a visit to our favorite bay Mersincik. Why it is our favorite bay? Because it has some nice snorkeling spots, great beach to walk along and if we get luck…Karel, our favorite loggerhead turtle will bring us a visit if it is not too busy in the bay. 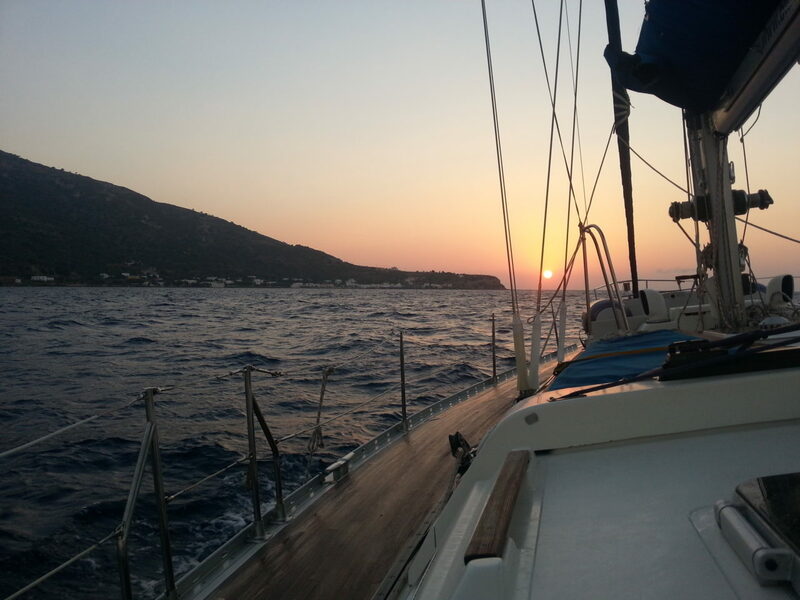 The last sailing day takes us back to our home port on Kos. Along the way we may make a stop in Aspat for lunch (if time allowesO and then arrive at our marina around 4 pm.